Need to get your fills on film? Zoom has delivered a range of great products in the Q series. Fantastic audio at a decent price. No MA2 mic stand adaptor. Video has never been more important to, or prolific with drummers than it is right now. Whether you’re attempting to teach online lessons, build your name as a gun for hire, or simply share your enjoyment with the world, plenty of the freshest faces in drumming have emerged via social media and video platforms like Facebook and Instagram. Now, the engaging angles, personality and raw talent are something you have to develop for yourself, but when it comes to video quality, there’s no shortage of options from smartphones to action cams to DSLRs. 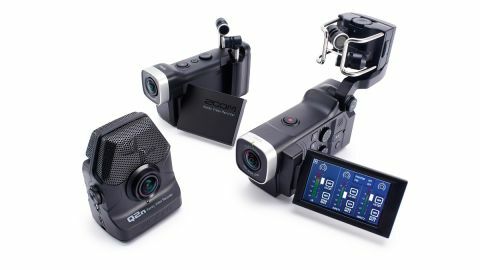 It’s a learning curve, each has its own distinct benefits and drawbacks, and none are cheap, but Zoom’s range of video cameras throw an additional option into the mix: they’re designed for musicians. A strange phenomenon has occurred with A/V technology since the advent of MP3s. We strive for better visual quality - from DVD to Blu-Ray, HD to 4K, we’re obsessed with resolution to the point that when we buy a new phone, it’s because it has a better camera. Along the way though, audio quality has become secondary. You barely need to scratch the surface of YouTube to find full HD videos with awful clipped, compressed, popping drum sounds. Let’s face it, using the built-in mics on most phones, action cams and DSLR cameras sounds bad. Zoom’s Q series has been around for a couple of years, starting with the flagship Q8, then followed by the Q4n, and now, the brand new Q2n. All models draw on Zoom’s reputation for broadcast field recorders and feature stereo condenser microphones onboard. Most importantly, they have proper trim controls to ensure that your audio remains intact, and when it does, it can be captured in uncompressed 24bit/96khz quality. Each model also includes a 160° wide angle lens, so you can fit your whole kit in shot easily, but with the option to zoom digitally (Q4n and Q8 only), and Zoom has taken the headache out of settings such as white balance and metering by including preset ‘Scenes’ based on the typical lighting environment of common musical scenarios (rehearsal rooms, stage lighting etc). What’s more, Zoom is clearly a company after the skin-tickler’s pound, as they’ve enlisted the heavyweight names of messrs Gadd, Weckl and Robinson to provide testimonials on their website. The Q8 and Q4n take on the appearance of a more traditional camcorder, and are extremely lightweight. They’re mounted using a standard tripod thread, but also come with a GoPro-style adaptor, which allowed us to use our GoPro’s mic stand mount on a typically battered rehearsal room mic stand without movement. Handy if you already own a GoPro and accessories. Both cameras also feature flip-out rotating screens which we found particularly useful while recording solo in a practice room for framing the shot, plus metering the audio. The touchscreen operation is intuitive enough, if not a little slow to respond by today’s standard. While both have onboard condenser mics, the Q8’s are interchangeable for optional configurations (not included), while the Q4n’s are fixed, but can switch between the X/Y (crossed) or A/B (spaced) positions depending on the width of stereo image you’re trying to capture. The Q8 has a masterstroke up its sleeve, though, and that’s the two XLR sockets on the back. Yep, the Q8 can actually record four audio tracks as well as shooting your video all at once. This is great news for drum videos as you can use the onboard mics as overheads/ room mics, while also capturing your bass drum and snare for further tweaking at the editing stage. The Q8 can also be used in ‘audio only’ mode if you want to. The Q2n is the newborn of the family, and Zoom has clearly taken on-board the best-loved functions of action cameras and applied it here - it’s bigger than a GoPro, but still small enough to fit neatly in a spare pocket on your stick/cymbal bag. It’s super lightweight at around 100 grams and, like the other two models here, features a fixed focus, mechanical trim pot for the audio and obvious ‘record’ buttons for speedy set-up and foolproof capture. If you do want to delve into the menus, they’re nicely laid out around the screen, and everything makes complete sense. The Q2n can be attached to a tripod too, although the body design means it does a good job of supporting itself on a flat surface. It’s a shame that Zoom hasn’t included the optional MA2 mic stand adaptor (which resembles the handle part of an SM57 for holstering in a mic clip), although with a street price of £8, it looks like an easy add-on and definitely worth investing at the time of purchase.